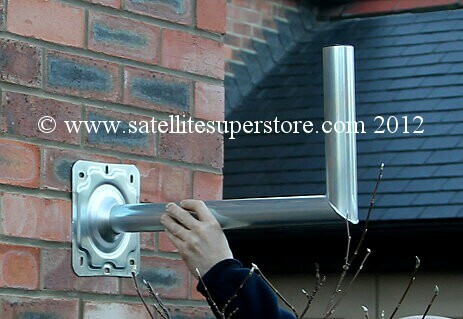 Satellite dish wall mounts and ground stands to fit most satellite dishes from the Satellite Superstore UK. Coach bolts and plugs, clamps, short and long poles. Heavy duty wall mounts. 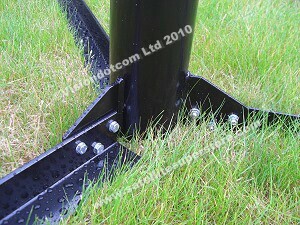 Ground stands with pole diameters of 50mm, 76mm, 115mm 6.5 inches. Ground stands for Raven, Andrews, Channel Master dishes. 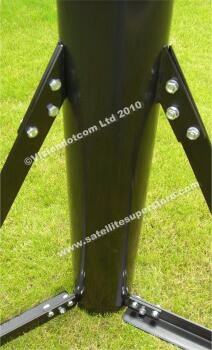 Non penetrating ground stands, pole adapter, masts, Long 2m pole wall mounts. 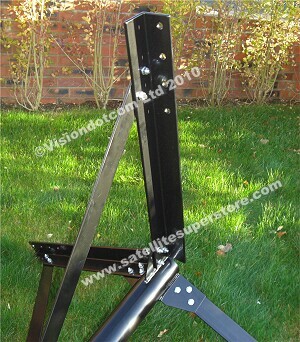 We manufacturer wall mounts, ground stands and pole adapters. 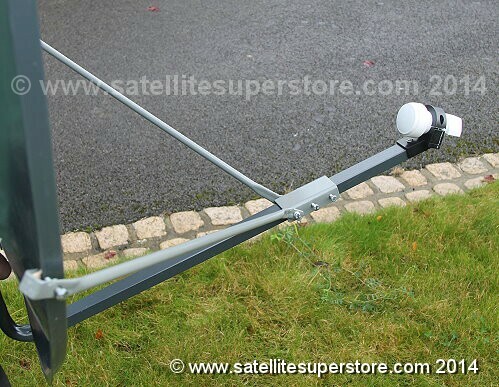 It is suitable for the Triax 90cm and heavy duty 90cm dish, the Primesat 1.0m, 1.1m, 1.25m and 1.3m fixed dishes. (which are fitted to our motorised dishes). 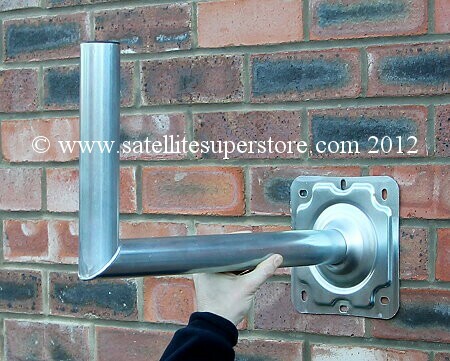 This is a 50mm diameter pole south facing 6 bolt "elbow" wall mount. 6 Coach bolts and plugs for fixing to the wall are available from the installation items page. See a smaller wall mount below. For "UK offshore islands including Northern Ireland" multiple items - choose the �15 - UK option No 2. Large Elbow 1DL. 6 bolt fixing. 480mm stand-off. Up to 360mm adjustable stand-off. close to the wall as possible. Result - looks better and less wind load. Pole diameter 40mm. (i.e. looking up or down street at right angles to wall) use the position of the U pole mount in the left hand pictures above. wider range of dish sizes than fixed stand-off elbow mounts. This wall mount is ideal for use with dishes up to 85cm. for fixing to the wall are available from the installation items page. For a larger stand-off select the large elbow above. U Pole wall mount 1E. 4 bolt fixing. 360m stand off. South Facing Wall Mount. J Elbow type. 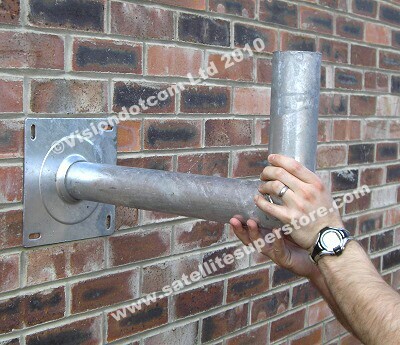 50mm pole dipped galvanised mount. ideal for use with this mount. 4 coach bolts and plugs for fixing to the wall are available from the installation items page. 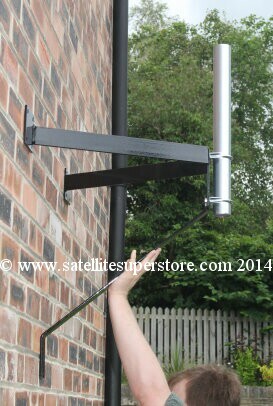 50mm pole, 360mm stand off dipped galvanised elbow mount. "Primesat Vision" heavy duty range. of ground stands & wall mounts. Why are our mounts "Primesat Vision" range different? facing walls, clearing the gutter is needed so the dish can turn without hitting the wall. 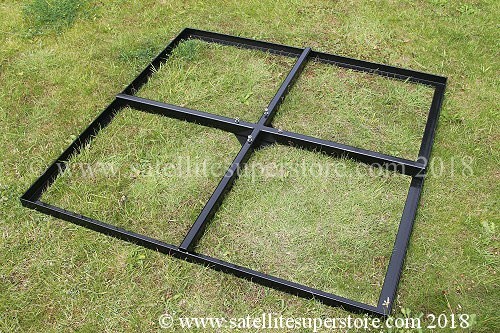 Our " Primesat Vision"
mounts are black They are etch-primed and stove baked powder coated in an oven. 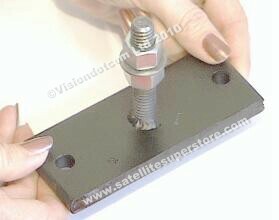 before our wall mount would fail", providing they are properly fitted and used on the correct size of dish. The south facing mounts are bolted with 10 bolt fixing, 4 to the left, 4 to the right and 2 at the bottom. 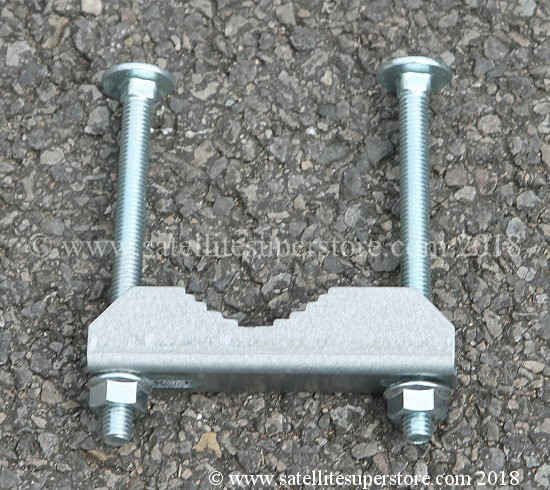 The "above gutter mounts" are 20 bolt fixing. (They are basically 2 south facing mounts with a long pole). not recommend this type of mount for satellite dishes. Some mounts are not even as good as T & Ks! 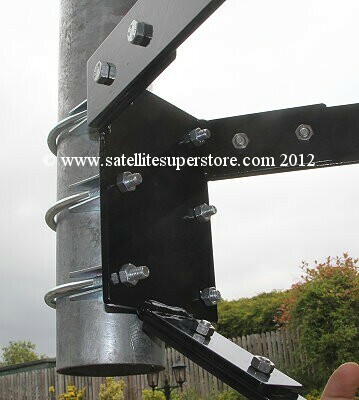 existing ground stand to the correct pole diameter for a different dish or motor. Note - we reserve the right to vary these specifications. 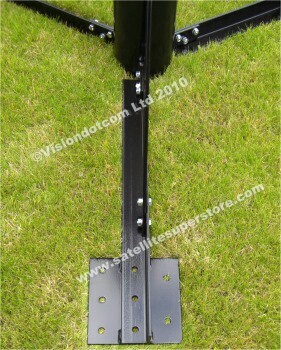 See all of our wall mounts, ground stands, masts, and pole adapters on the wall mount menu page. size is not too large or the location is reasonably sheltered. Primesat south facing wall mount. 450mm stand off. Heavy duty range. 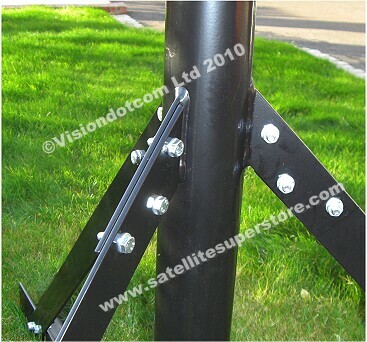 Black mount with galvanised pole and 4 galvanized clamps included. The mount is etch-primed and then oven baked powder coated. Please note all of our mounts are now bolt together". Just as strong but easier and less costly to ship via mail order. The lower pictures above show the 76mm pole mounts as "bolt together" but the 50mm pole mounts above are now also "bolt together". Manufactured by The Satellite Superstore. An exclusive high quality product. More information. Coach bolts and plugs for fixing on the wall are available from the installation items page. (10 required). 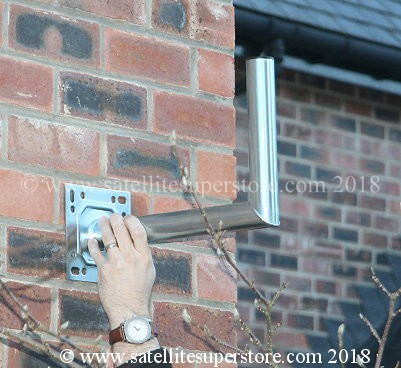 South facing wall mount with 450mm stand-off. 50mm galvanised pole and galvanised clamps. 550mm stand off. Heavy duty range. and transparent 85cm, the Triax 90cm and Primesat 1.0m and 1.1m dishes. 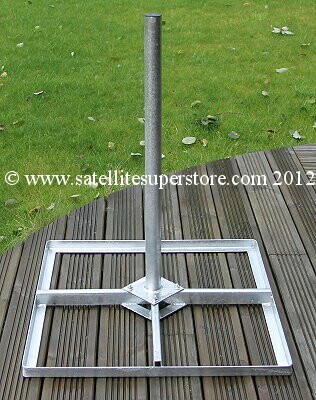 76mm heavy duty galvanised pole. right and 2 to the bottom. Coach bolts and plugs for fixing on the wall are available from the installation items page. (10 required). Ideal for dishes up to 1.0m that need a 3 inch diameter pole. 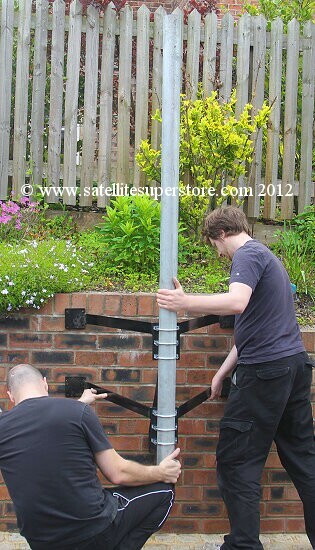 Black mount with galvanised pole and 3 galvanised clamps included. use the 550mm stand off mount below. Also ideal for motorised use with the Primesat PR3600B motor. More information. Please note the mounts are now "bolt together" Just as strong but easier and less costly to ship via mail order. dishes of 85cm, clear 85cm, 90cm 1.0m and 1.1m. Manufactured by the Satellite Superstore. An exclusive high quality product. (Note 1. Mast is 500mm) (Note 2. The Raven 1.2m dish was formally known as "Andrews and before that "Channel Master"). 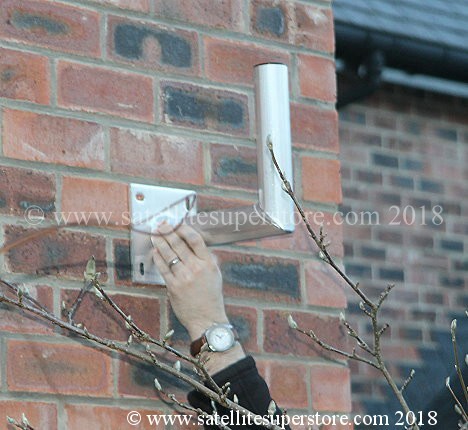 South facing wall mount with 450mm stand-off. 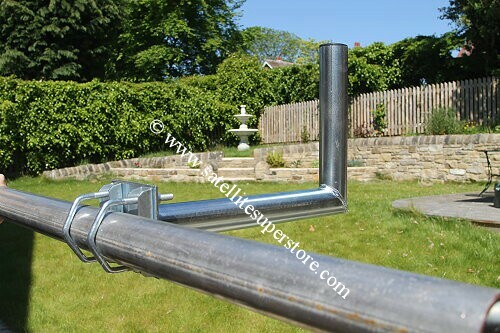 76mm galvanised pole and galvanised clamps. The 550mm version looks similar to a 450mm (above) but has an extra 100mm of stand off which is required for larger dishes. Ideal for dishes up to 1.0m which need a 3 inch diameter pole. 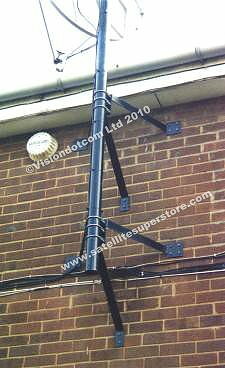 Black mount with galvanised pole and 3 galvanised clamps included. and the Raven 1.2m and Primesat 1.4m motorised dishes Also ideal for motorised use with the Primesat PR3600B motor. More information. be ideal for use with the Primesat 1.1m dish. Manufactured by the Satellite Superstore. An exclusive high quality product. 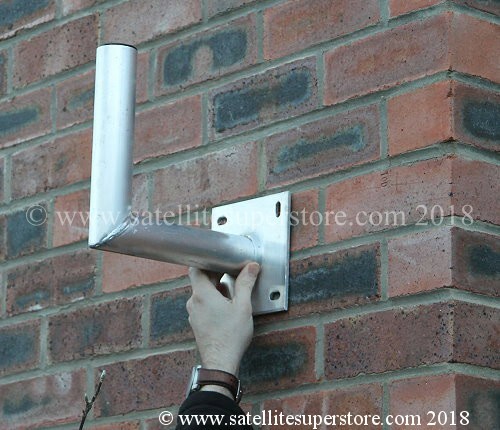 South facing wall mount with 550mm stand-off. 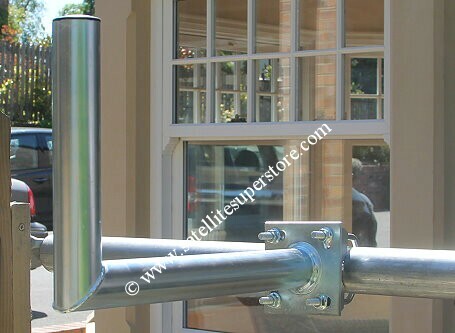 76mm galvanised pole and galvanised clamps. Our own "Primesat Vision" heavy duty range. Manufactured since 1991. More information. 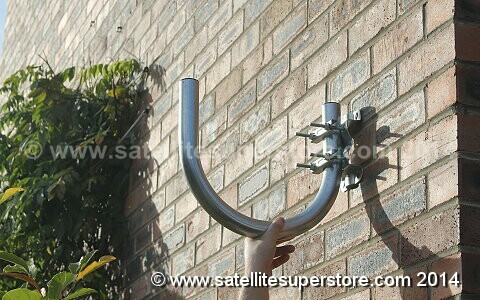 Wall mounts for fitting the dish above the gutter. 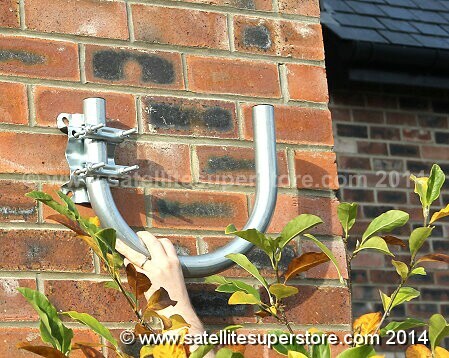 Primesat double mount "above the gutter"
for dishes up to 1.3m. 50mm pole. 100mm stand off. Heavy duty range. as shown in the middle and left hand pictures. a 2m pole is included if required. 4 x 50mm clamps are included. Usually for north, east or west facing walls in locations where there is a gutter and a reasonable stand-off distance is required. Primesat motorised - 85cm, and transparent 85cm, the Triax 90cm and Primesat 1.0m 1.1m and 1.3m dishes. 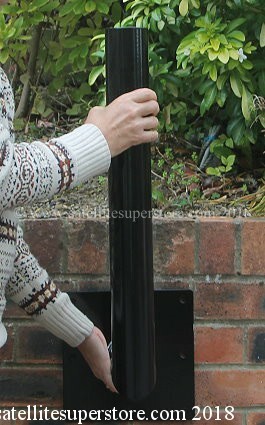 Black mount and galvanised pole. 4 galvanized clamps. The mount is etch-primed and then oven baked powder coated. charge is fine. You would need to let us know if that was agreeable. Tel. 01207 544664 if you want the pole trimming to 1.75m. UK - mainland delivery is included in the price, so choose "Mainland UK delivery included" UK shipping option No 1. UK offshore Islands and Southern Ireland - due to the size - shipping quote by e-mail or phone (about �40 to offshore islands). International - within the EU - choose the "International shipping quote by e-mail" shipping option. 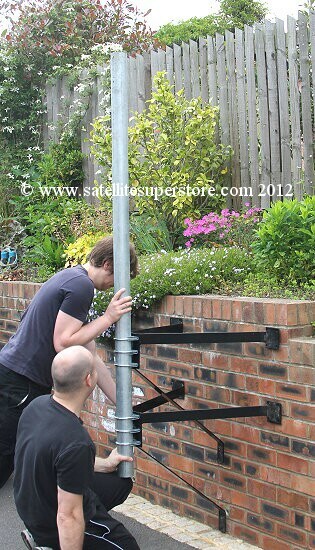 you could source the pole locally and save on shipping charges with this option. Clamps are included. 300mm stand off. Heavy duty range. know if that was agreeable. Tel. 01207 544664 if you want the pole trimming to 1.75m. Usually for north, east or west facing walls in locations where there is a gutter and a larger stand-off distance is required. 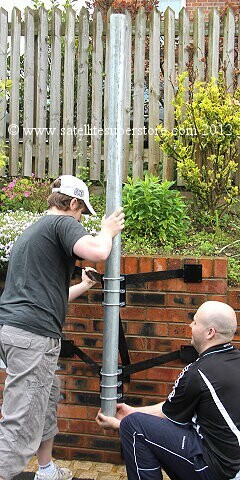 Black mount and galvanised pole. 4 galvanized clamps. The mount is etch-primed then oven baked powder coated. features. Just as strong but easier to ship via mail order. Usually for north, east or west facing walls in locations where there is a gutter and a large stand-off distance is required. 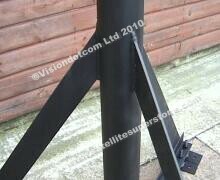 Black mount and galvanised pole. Galvanized clamps. The mount is etch-primed with an oven baked final coating. 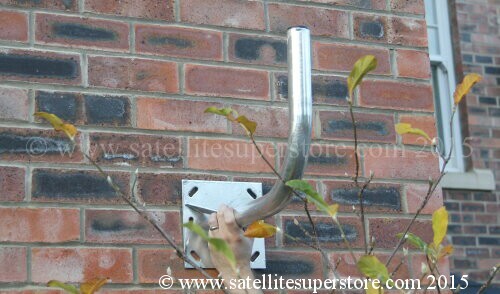 Primesat double mount "above the gutter". 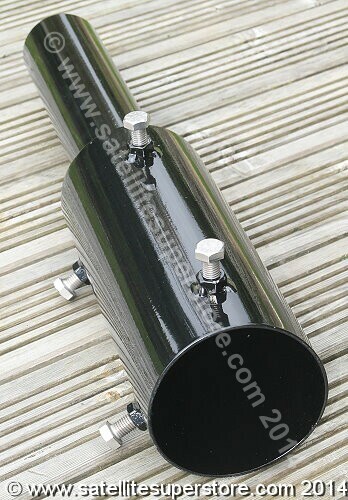 76mm diameter, 2m or 3m pole. 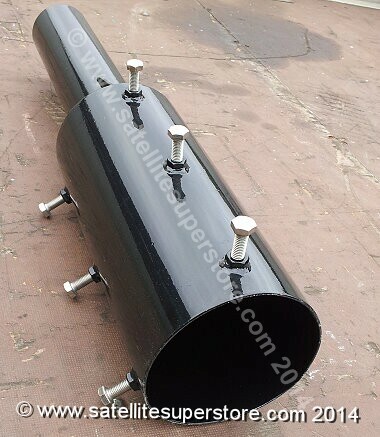 50mm (2") diameter mast at 2.0m long. 300mm stand-off. 2m pole with 3m pole options. and 1.3m fixed dishes and the Primesat motorised - 85cm, and transparent 85cm, the Triax 90cm and Primesat 1.0m 1.1m and 1.3m dishes. then oven baked powder coated. Manufactured by the Satellite Superstore. An exclusive high quality product. More information. Also ideal with the Raven 1.2m and Primesat 1.4m fixed dishes and the Raven 1.2m and Primesat 1.4m motorised dishes. All mounts are now bolt together. An example of a different mount is in the centre but it illustrates the bolt together features. Just as strong but easier to ship via mail order. 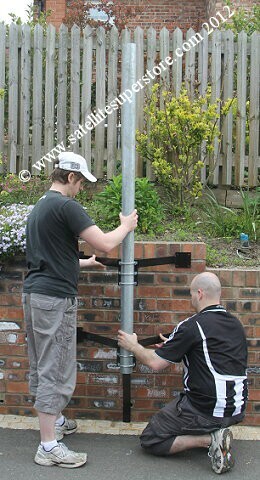 One of the pictures above show a black pole but all poles are now galvanised. 300mm stand-off 76mm double mount with legs "above the gutter". Without pole. 450mm stand-off. Heavy duty range. 76mm (3") diameter mast. 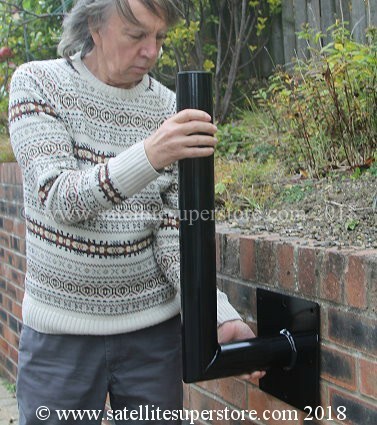 450mm stand-off (to clear gutter). 2m pole with 3m pole options. The bottom left picture shows an earlier 3m pole version which did not have a galvanised pole and with a 550mm stand-off. Suitable for heavy duty dishes up to 1.4m. 20 bolt fixing, 8 to the left, 8 to the right and 2 to the bottom of each mount. motorised dishes of 85cm, clear 85cm, 90cm 1.0m 1.1m and 1.3m dishes. high quality product. (Note - The Raven 1.2m dish was formally known as "Andrews" and before that "Channel Master"). 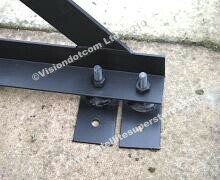 450mm stand-off double mount with legs "above the gutter" mount. Including 2m pole, 76mm diameter. Including 3m pole, 76mm diameter. 450mm stand-off 76mm double mount with legs "above the gutter". Without pole. 550mm stand-off. Heavy duty range. 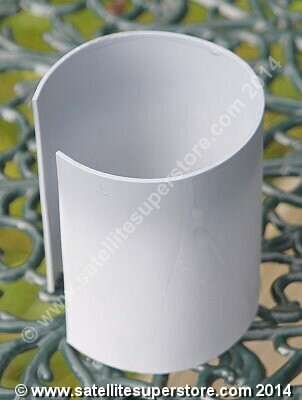 76mm (3") diameter mast. 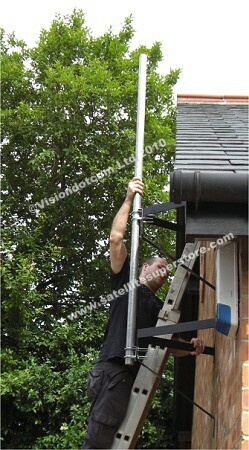 550mm stand-off (to clear gutter). 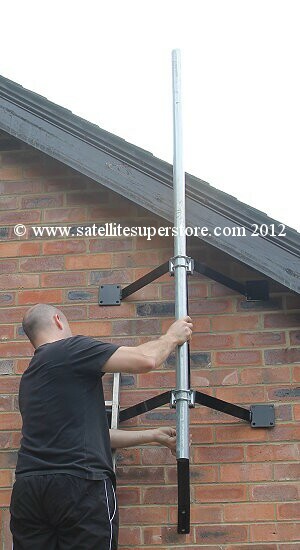 2m pole with 3m pole option, See 3m pole upgrade. 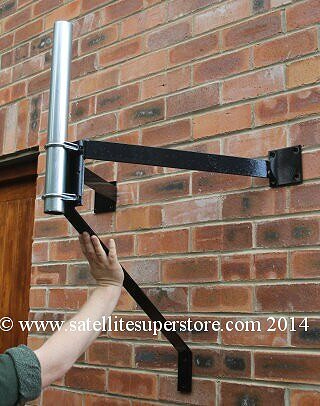 550mm stand-off double mount with legs "above the gutter" mount. 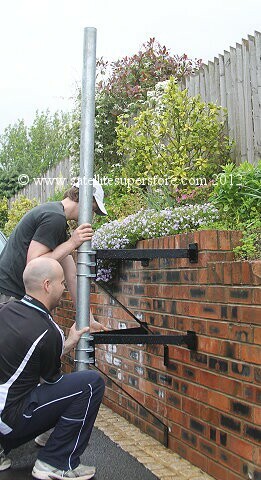 550mm stand-off double mount with legs "above the gutter". Without pole. 90cm high low cost galvanised 50mm diameter (2.0") ground stand for dishes up to 1.0m. For "UK offshore islands including Northern Ireland" mutiple items - choose the �15 - UK option No 2. 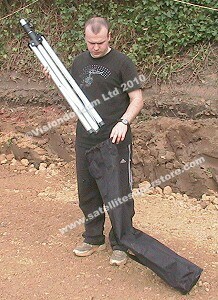 Primesat low cost 50mm diameter pole 90cm high ground stand. 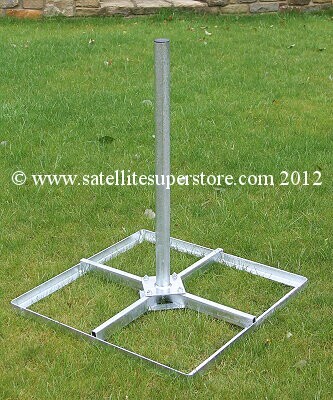 1.2m high low cost galvanised 76mm diameter (3.0") ground stand for dishes up to 1.5m. 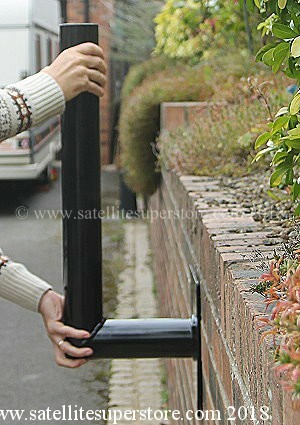 Primesat low cost 76mm diameter pole 1.2m high ground stand. motorised - 85cm, and transparent 85cm, the Triax 90cm and Primesat 1.0m and 1.1m dishes. 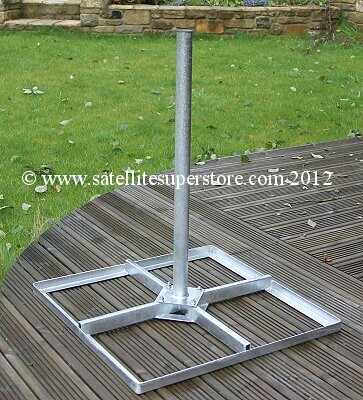 Special offer - Galvanised 42mm Diameter 750mm high non penetrating ground stand. the square recesses with concrete. 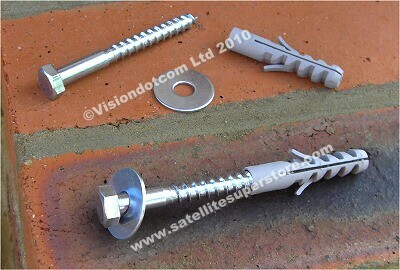 It is ideal for a flat roof where fixings are not possible. now fitted as standard. The side supports increase the rigidity and strength of these mounts. The 76mm pole 1.0, 1.5 and 2.0m high mounts are suitable for the Raven 1.2m and Primesat 1.4m dishes and many other applications. 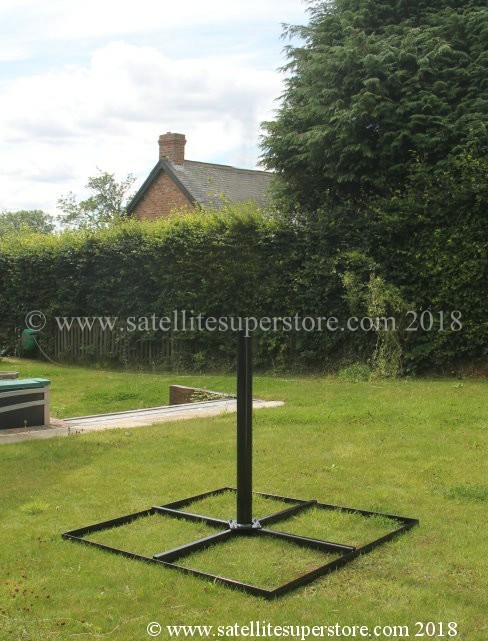 The 76mm pole 1.5m high mount is suitable for the Primesat 1.8m dishes and Raven 1.8m motorised dish and many other applications. 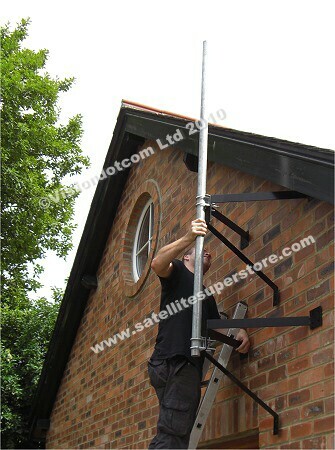 The 115mm pole mount is suitable for the Raven 1.8m fixed dish and many other applications. We can custom make one of these mounts for you if you have a different requirement. 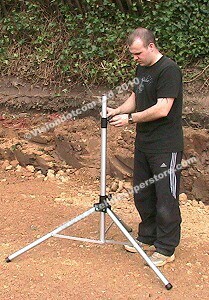 Primesat 76mm diameter heavy duty 1.0m high non-penetrating ground stands. 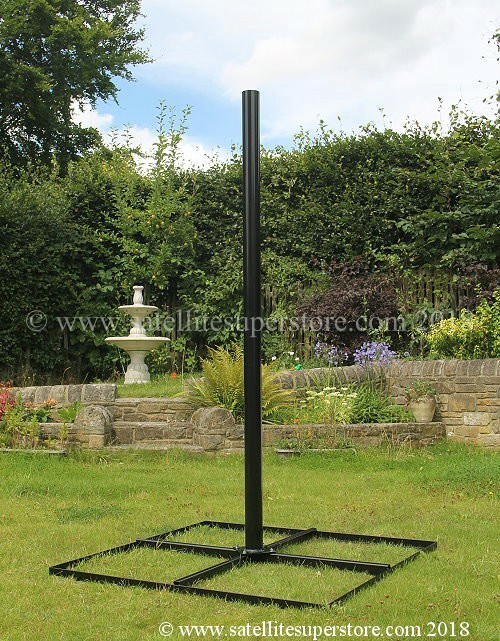 Primesat 76mm diameter heavy duty 1.5m high non-penetrating ground stands. 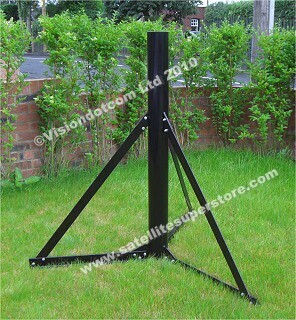 Primesat 76mm diameter heavy duty 2.0m high non-penetrating ground stands. 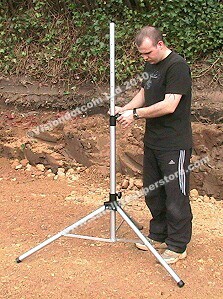 Primesat heavy duty 50mm diameter pole 1m high ground stand. heavy duty adjustable feet. Approx. diameter of base 38 inches. Available with or without the 3 adjustable feet. The mount is etch-primed with an oven baked final coating. A very good black gloss finish is achieved. Primesat welded heavy duty 50mm dia. pole 1m high ground stand with 3 feet. The 3 feet are needed to easily make the pole vertical for motorised dishes. Primesat welded heavy duty 50mm dia. pole 1m high ground stand without feet. For use with a fixed dish, the adjustable feet may not be needed. Primesat bolt-together heavy duty 50mm dia. pole 1m high ground stand with 3 feet. Primesat bolt-together heavy duty 50mm dia. pole 1m high ground stand without feet. exclusive to the Satellite Superstore. The stand is etch-primed with an oven baked final coating. A high quality product. is built at the time of ordering. 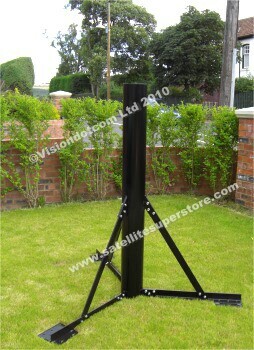 Fully welded stands are in stock. Bolt-together stands take up to 5 working days to manufacture. areas and so click on the link here to see if your post code is covered. The postcodes are provided by "Parcelforce". welded stand to an EU country would be �100+ and �400+ to the USA! Select bolt-together for international shipping. and offshore islands including Northern Ireland select the �15.00 offshore islands option. - UK shipping option No 2. Bolt-together stands. UK and International shipping. For all UK mainland destinations select shipping option 1. Shipping is included in the price. International - outside of the EU - choose the "International shipping quote by e-mail" option. (About �60.00 to the USA). 3 adjustable feet for a ground stand. 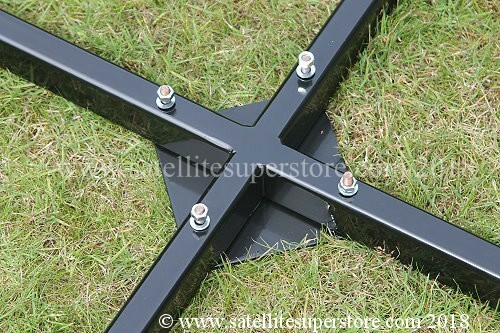 Primesat 3 adjustable feet for a ground stand. is heavy but it needs to be. The pictures above were taken in the rain so dots on the paintwork are just rain drops. since 1991. 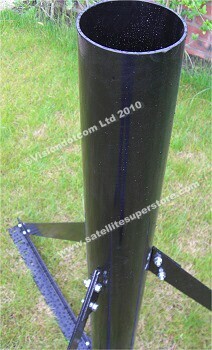 More information The motorised 1.8m Raven dish needs a pole diameter of 80mm and that stand is below. Coach bolts and plugs for fixing the ground are available from the installation items page. This is a special order item. It is manufactured for the customer when an order is placed. Allow up to 3-5 working days to manufacture this stand. A non penetrating mount for this dish is available above. size could not be transported with a courier and would need a (expensive) haulage company, so this stand bolts together. Multiple bolts are used for maximum rigidity. The stand is heavy but it needs to be. More information. 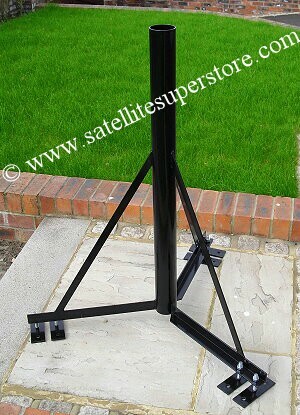 This stand is designed for our motorised version of the 1.8m Raven dish but could be used for other applications. is placed. Allow up to 5 working days to manufacture this stand. Option. 3 adjustable feet for motorised use. 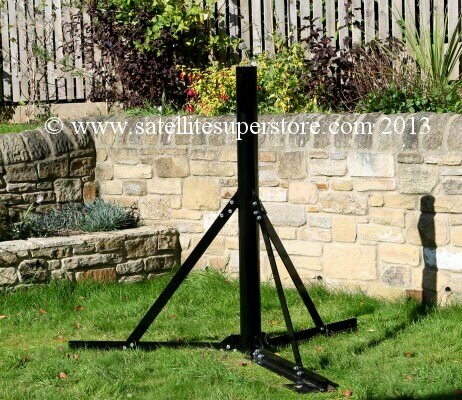 This is an option (discounted price) when ordering a ground stand. Feet are not included with the stand above. quality product. Our own "Primesat Vision" heavy duty range. 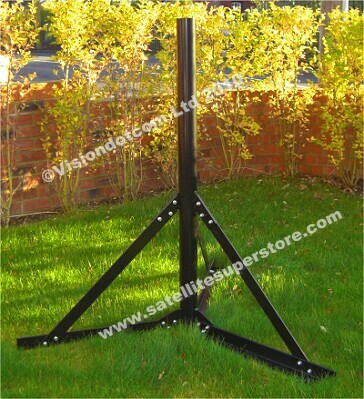 Manufactured since 1991.
motorised 2.4m Raven dish needs a pole diameter of 100mm and that stand is below. This is a special order item. It is manufactured for the customer when an order is placed. Allow up to 5 working days to manufacture this stand. All internationals - EU (& Eire) and outside of the EU - choose the "International shipping quote by e-mail"
Manufactured by the Satellite Superstore. This is our own stand. 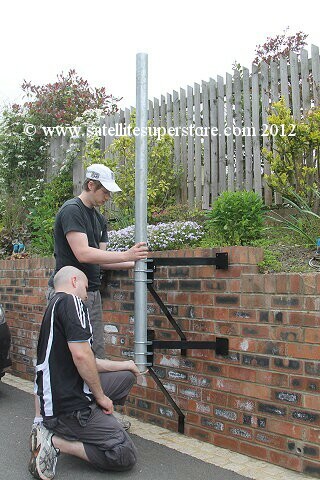 It is 1.4m high and uses a 100mm (4.0") pole. is placed. Allow up to 5 working days to manufacture this stand. The weight of this ground stand is 48Kg. The Primesat Pole Adapter 453 is designed to fit on a 115mm (4.5") pole and convert it to a 76mm (3") pole. shim was developed to make a perfect fit between the Primesat motor unit and the Primesat pole adapter. manufactured for the customer when an order is placed and charged. Allow up to 5 working days. Converts a 115mm, 4.5inch pole to 76mm, 3.0inches. This shim is designed to convert a 76mm pole to 80mm. fit between the Primesat motor unit and a 76mm (3inch) pole. the Raven / Channel Master 1.8m dish since 1991. Primesat 7680 Shim. Converts a 76mm pole to 80mm. 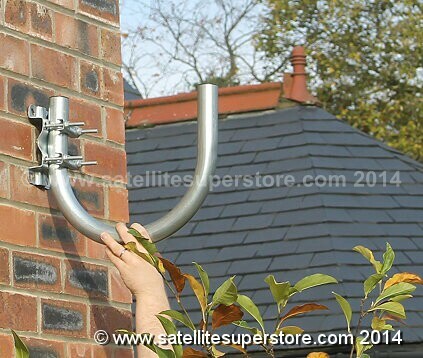 The Primesat Pole Adapter 654 is designed to fit on a 165mm (6.5") pole and convert it to a 100mm (4") pole. Converts a 165mm, 6.5inch pole to 100mm, 4.0inches. 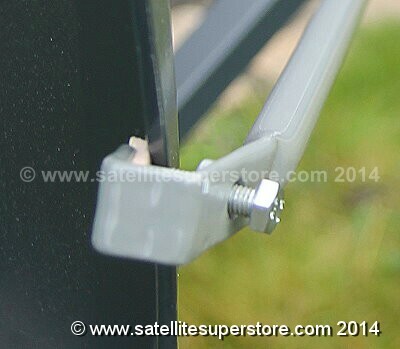 Primesat feed support arm side stabilisers. For 90cm to 1.1m dishes. arms and not circular arms. Due to the length, this kit must be shipped by courier, it is too long for post. box section (E.G. Primesat 1.0m and 1.1m dishes). box section (E.G. Triax TD88, 90cm and TD1.1m dishes). The following products are not manufactured by Satellite Superstore. but they have been selected as good quality at a reasonable price. 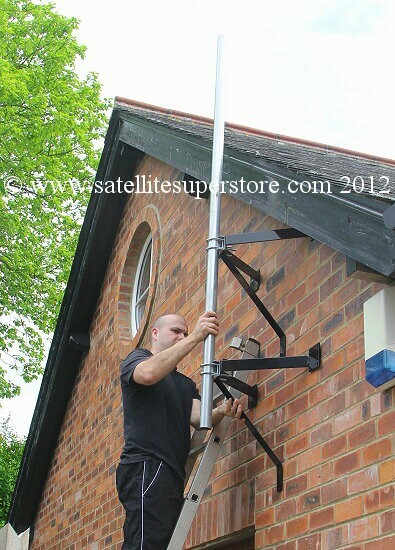 distance like the Primesat 85cm dish or transparent 85cm, or the Triax heavy duty 70cm. 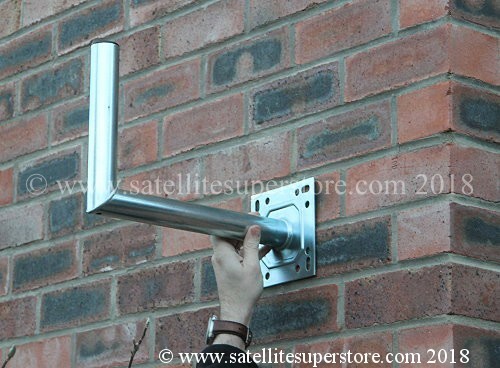 This wall mount not suitable for Raven dish as they need a 76mm (3-inch) pole. Primesat elbow (small) AM1S. 4 bolt fixing. 230mm stand off. (which are fitted to our motorised dishes). fixing "Elbow". Coach bolts and plugs for fixing onto the wall are available from the installation items page (6 required). South Facing Wall Mount. Elbow type. 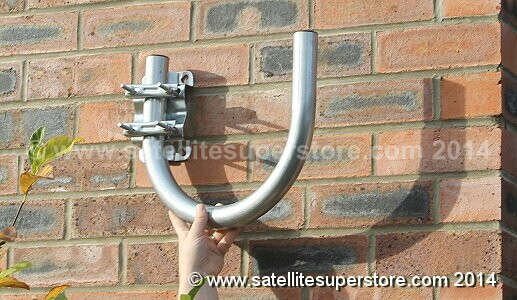 40mm pole dipped galvanised mount. 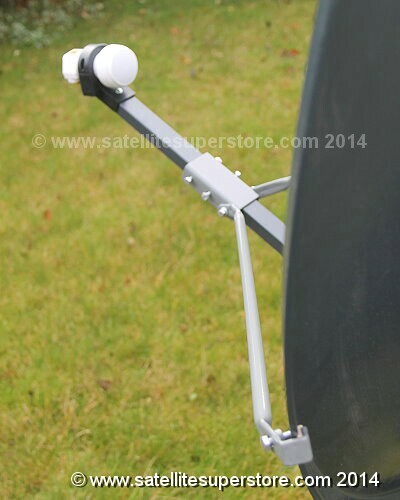 needing only a medium stand off distance like the Primesat 85cm dish and transparent 85cm,. Primesat elbow (medium) PW33. 4 bolt fixing. 330mm stand off. 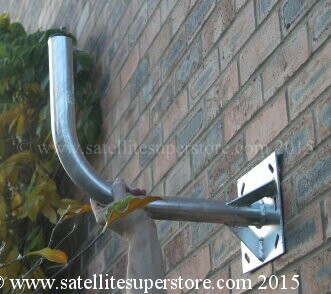 76mm diameter pole south facing wall mount (Elbow) (2 types). 450mm and 250mm stand off distances. 76mm. This mount has a 76mm (3") diameter mast. 450mm stand-off. Suitable for dishes up to 1.2m. See lower 3 pictures above. 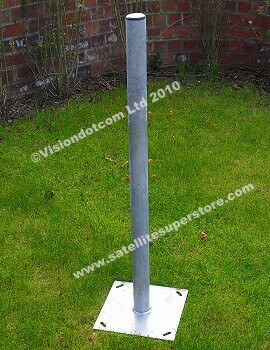 With this mount other stand-off distances and pole heights can be ordered at this price if you contact us. Special order - This quantity pricing reduces the price per mount to �89.99 See lower 3 pictures above. Clamps reverse to go on vertical pole. 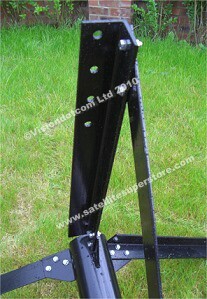 Also use as a jockey wheel mount for caravans. dishes, the Primesat transparent 85cm, the Triax heavy duty 70cm and 90cm and the Triax TD range 90m fixed dishes. a larger dish would hit the balcony if turned east or west too far. 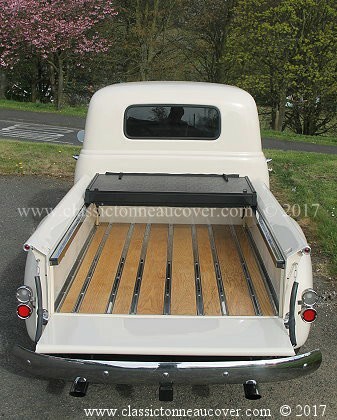 This is the new deluxe model - now with a 500mm height extension. Useful carry bag now included. and the Primesat aluminium 1.0m, 1.1m fixed dishes. 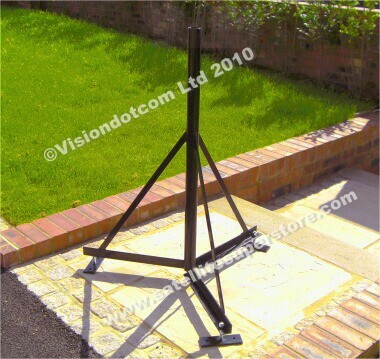 This stand can be erected or folded in seconds. came apart before we even had time to photograph them. It's the old story - you get what you pay for! (similar idea). 5 coach bolts and plugs for fixing to the wall are available from the installation items page. 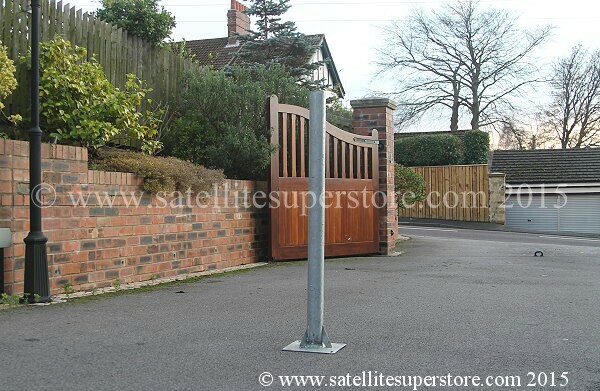 maximum pole length we can ship is 1.0m without extra charges (by quotation). 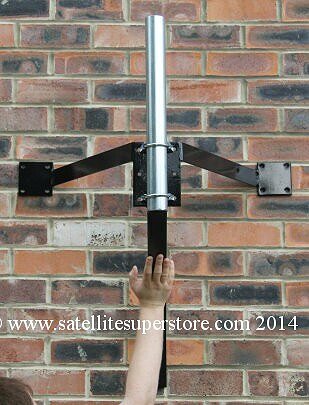 Long pole wall mount 3. Stand off - 300mm. 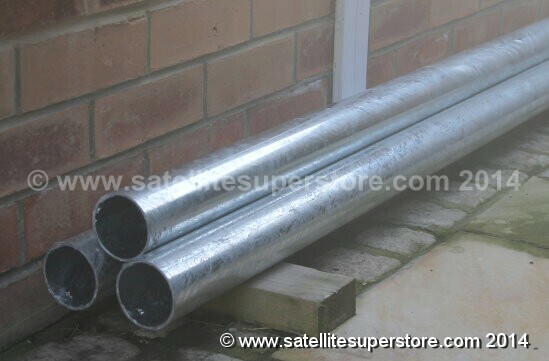 1.0m galvanised pole. Long pole wall mount 4. Stand off - 500mm. 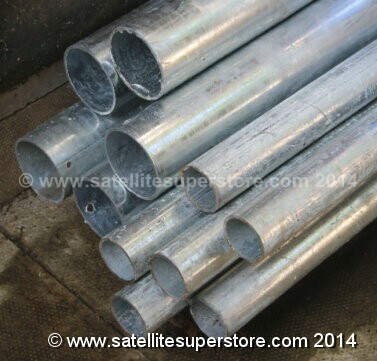 1.0m galvanised pole. 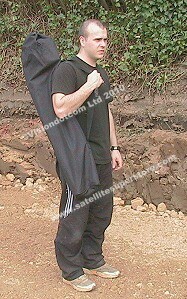 Please note, 2m poles are oversized and have to be sent using a 48 hour courier. Sometimes customers want to "double-up" on the brackets. i.e. twice as many brackets on one pole. Or, customers already have a pole. mount and sourcing the pole locally is preferred. 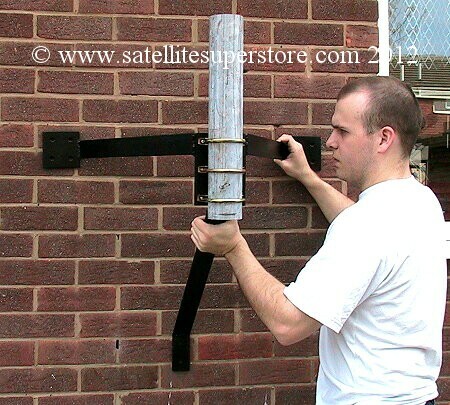 Long pole wall mount 1. Stand off - 300mm. Without pole. 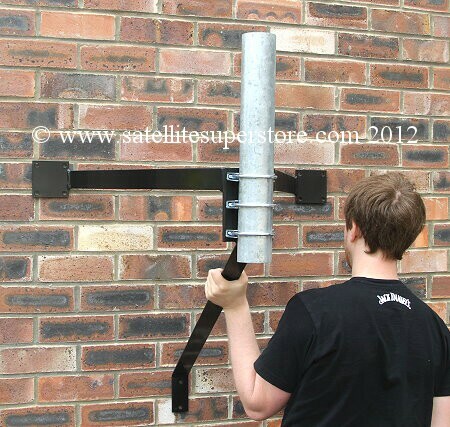 Long pole wall mount 2. Stand off - 500mm. Without pole. Far left above - 76mm (3-inch) clamp. 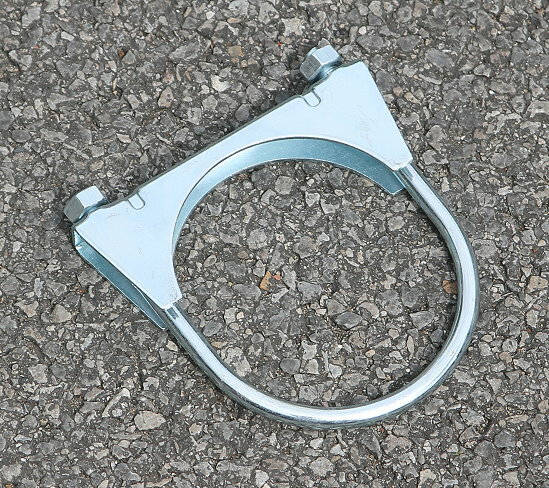 Middle left - 50mm (2-inch) double clamp. The 50mm double clamp can be used to join two 50mm poles. 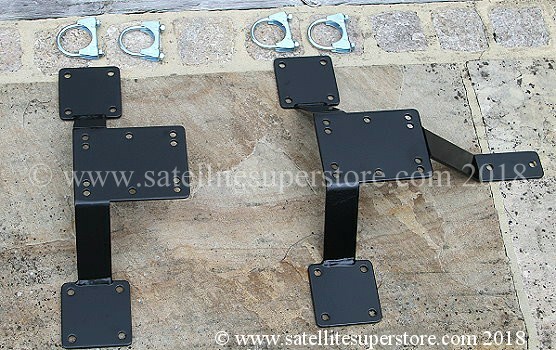 Middle right 50mm clamp, far right Sky mini dish clamp. All Galvanised. 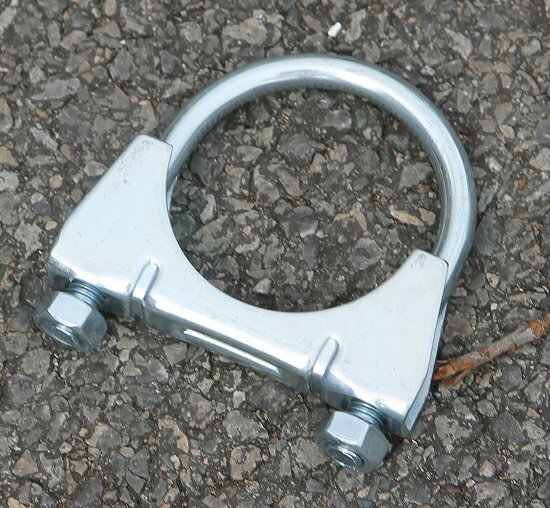 One 50mm galvanised single clamp. (See above). 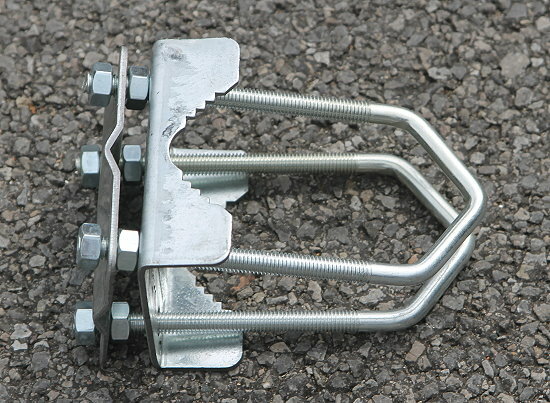 Three 50mm galvanised single clamps. (See above). Sky mini dish clamp. (See above). ground stands are available separately. wall mounts higher up the page. Our own "Primesat Vision" heavy duty range. 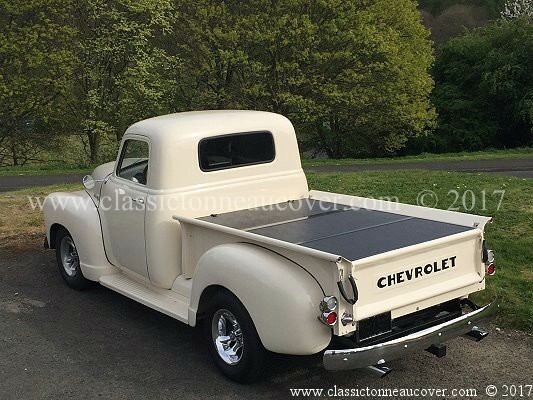 Manufactured since 1991.
to that length and then the �15.00 shipping charge is fine. You would need to let us know if that was agreeable. UK offshore island (and Eire) by courier" - International shipping quote by e-mail" shipping option. Heavy Duty 2m long, 50mm (2-inch) diameter, galvanised. below. 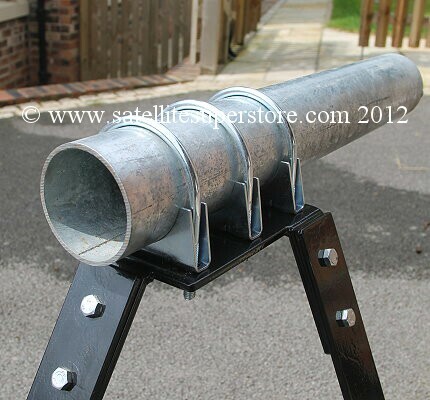 1m long, 50mm (2-inch) diameter, galvanised. below. 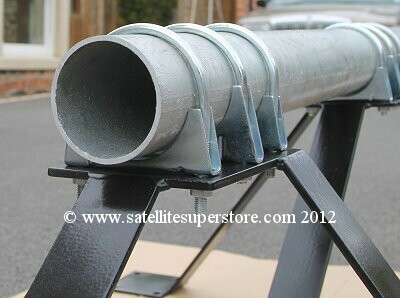 2m long, 50mm (2-inch) diameter, galvanised. Heavy Duty 2m long, 76mm (3-inch) diameter, galvanised. Heavy Duty 3m long, 76mm (3-inch) diameter, galvanised. 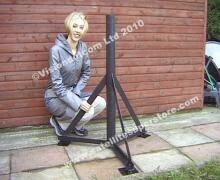 Heavy Duty 1.8m long, 114mm (4.5-inch) diameter, galvanised. onto the top of the it. (The Raven 1.2m dish was formally known as "Andrews and before that "Channel Master"). Designed for the satellite industry. 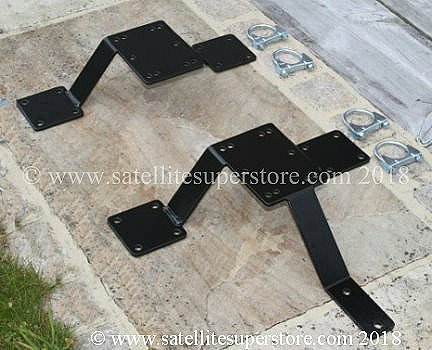 Use as fixings for our range of wall mounts and ground stands.